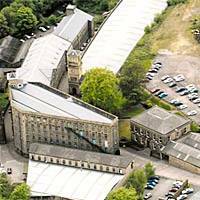 A MULTI-MILLION pound "village" is planned for one of Calderdale's oldest mills. John Holdsworth textile manufacturers, of Shaw Lodge Mills, Halifax, is reorganising its massive 176-year-old site. Production will be confined to half the 300,000 square foot factory. The rest is to be redesigned by award-winning developers St James Securities, of Leeds. Holdsworth's managing director John Simpson said: "We are going to create a new community here. We have a vision of a combination of residential, workplaces, offices and facilities like a health centre, dental practice, shops and sport complexes. "They are wonderful buildings and so close to the centre of Halifax. It is an ideal location and we have no intention of seeing it go to waste. We want to try and build a real community, not be Dean Clough number two." St James Securities has put in a planning application to Calderdale Council. The company has created stunning developments across the north, including The Light in Leeds and Wakefield Waterfront. Roland Stross, director of St James Securities, said: "Inevitably a 19th century manufacturing site is not suitable for the 21st century. Shaw Lodge Mills site is widespread, with some buildings on seven levels and we want to make more appropriate use of all these. "Our application will seek approval for a mixed redevelopment of part of the site, which will create jobs, provide new housing and community facilities." Fifteen of the exisitng 175 jobs will be lost in the shake-up. The firm makes cloth for bus and train seats. Mr Simpson said: "Any job losses are a tragedy and we will help them to get alternative employment. But we think the changes will give us the right answers for the future." With acknowledgement for this contribution from The Halifax Evening Courier, 23 February 2006 .